Shortly after their development, lasers were referred to as a solution eagerly looking for a problem. Nevertheless, lasers progressed rapidly as an omnipresent part of modern technology and procedural medicine. Advances in lasers and fiberoptics have made them ideally suited to travel through routes in the human body where no hand or scalpel has gone before. With its widespread use of small-diameter endoscopic instruments, urology has been drastically and positively influenced by this technology, perhaps more so than any other medical subspecialty. Laser is an acronym that stands for light amplification by the stimulated emission of radiation. Albert Einstein proposed the concept of stimulated emission of radiation in 1917. Not until 1960, however, was this theory put to use by T.H. Maimen to produce the first visible light laser. He used a synthetic ruby crystal with silver-coated ends surrounded by a flash tube to produce light energy. In 1966, Parsons, using a similar ruby laser in a pulsed mode, was the first urologist to experiment with laser light in canine bladders. 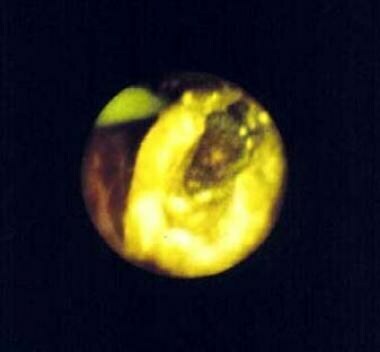 Mulvany attempted to fragment urinary calculi 2 years later, again using the ruby laser. Subsequently, researchers tested many new substrates or lasing materials, leading to diversity in their clinical application. Einstein used 2 principles of physics as the basis for his discovery: (1) Light travels in packets of energy known as photons, and (2) most atoms or molecules exist naturally in a ground or low-energy state (E0). However, a small percentage of atoms naturally exists at any given time at a higher, discrete energy level (E1, E2, En). By adding electricity, heat, or light energy to atoms in their ground state, their energy level can be raised. The energy is then released spontaneously in the form of photons or electromagnetic (EM) waves to return to the ground state. Einstein also discovered that, when a photon of light energy of the same wavelength strikes an excited atom (En), that photon and the photon of light that is released are discharged simultaneously and will therefore be identical in frequency and phase. This is the concept of stimulated emission used in the creation of a laser. Atoms in their ground state undergo absorption of photons of light energy. For stimulated emission to occur, more atoms must exist in the excited state than in the ground state, a situation known as a population inversion. Energy must be supplied to this population. In a laser, the energy source is usually electric or flashlamp driven. The populations of atoms or molecules that become excited are the lasing medium. The lasing medium exists between 2 mirrors for light amplification to occur; one is fully reflective and the other only partially reflective. Once the lasing medium at the core is excited by a pumping mechanism that supplies energy, a population inversion occurs. Some photons are emitted spontaneously from the excited atoms or molecules that cause light to travel in all directions within the laser cavity. The light that is directed perfectly parallel to the laser cavity is reflected back and forth between the 2 mirrors at their ends. These photons become amplified by collisions with excited atoms in the lasing medium that then release photons in exactly the same direction, phase, and wavelength. The partially reflective mirror at one end has an aperture through which the amplified light exits as a laser beam. The 3 characteristics mentioned above differentiate laser light from natural light. These include coherence (the photons are all in phase), collimation (they travel parallel with no divergence), and monochromaticity (they all have the same wavelength and, therefore, the same color if within the visible light spectrum). Different lasing mediums (which can be solid, liquid, or gas) emit photons in different wavelengths of the EM spectrum. This is at least partly responsible for the unique characteristics of a particular laser. Other characteristics that affect laser performance include the power output and the mode of emission (eg, continuous wave, pulsed, or Q-switched). Continuous wave lasers emit a steady-state, uninterrupted beam. Pulsed lasers have further subdivisions, yet they all allow for more precise control and less lateral heat conduction to tissues than a continuous output laser. A gated pulse laser has a timed interrupted output with a peak power no higher than if the beam were emitted continuously. A true pulse refers to a mode in which the power output is built up between pulses, resulting in a higher peak power than a continuous mode. A superpulse is similar to true pulse; however, the frequency of pulses per second is so fast (about 300-1000/s) that the beam appears to be continuous. Finally, a Q-switched mode refers to a pulsing technique that produces very high peak power outputs (on the order of tens of millions of watts) for very short durations (a few nanoseconds). This allows for minimal lateral heat conduction and a more precise, directed effect. The physical properties of a laser can be described using 4 key concepts—energy, power, fluence, and irradiance. Energy describes the amount of work accomplished and is measured in joules. Power refers to the rate of energy expenditure and is measured in joules per second, or watts (1 J/s = 1 W). The total energy applied to a given tissue is a function of the power multiplied by the duration of time the tissue is exposed. The fluence, otherwise known as power density, describes the amount of energy delivered per unit area (J/cm2) and is far more important in determining a laser's effect on tissues than total energy delivered. Irradiance is a term used to describe the intensity of a laser beam, and it is measured in watts per square centimeter. Irradiance is also inversely proportional to the square of the spot size radius. Lenses or optical fibers can manipulate the fluence or power density of a laser. Lenses focus or defocus a beam to change spot size even when the laser is kept at a constant distance from tissue. Optical fibers used in laser beam delivery often allow for 10-15° of beam divergence upon exit from its tip. This results in defocusing of the beam with increasing distance from the tip of the fiber. Within a 1-inch working distance, laser intensity can change from making incisions (closest, most concentrated spot size) to vaporizing tissue surfaces (slightly defocused) to coagulating proteins (greatest distance). Halving the spot size of a laser beam, while keeping the amount of energy delivered constant, increases the energy density by a factor of 4 (energy density is inversely proportional to the square of the spot size radius; equation = E/[pi][r2]). Local tissue properties, combined with the wavelength of laser light used, further affect the quality of the laser-tissue interaction. Examples of tissue properties include the density, degree of opacity (eg, quantity of pigments), water content, and blood supply of the tissue. The more dense or opaque a tissue is, the greater the degree of absorption of light energy and the greater the degree of transformation to heat. Molecules, proteins, and pigments may absorb light only in a specific range of wavelengths. Hemoglobin, for example, absorbs light energy that has a wavelength as high as 600 nm and is translucent to light beyond this range. (The argon laser produces light of 458-515 nm and, therefore, is heavily absorbed by hemoglobin.) Water also absorbs in a specific wavelength range, beginning with a small amount of absorption from 300-2000 nm, at which point the degree of absorption increases rapidly and continues for several thousand nanometers. The CO2 laser produces light in the far infrared spectrum, at 10,600 nm. This is heavily absorbed by water contained in tissue and, therefore, does not penetrate deeply. Local blood circulation affects the degree of laser energy absorption via 2 mechanisms. First, as mentioned above, the absorptive properties of individual blood components (eg, hemoglobin, water) differ and interact with light in specific wavelength ranges. Second, the circulating blood acts as a heat sink or radiator by transporting absorbed thermal energy away from the site of delivery. This effectively blunts laser power by opposing its local thermal effects. The wavelength of laser light can be proportional to the depth of penetration into specific tissues. The longer the wavelength, the deeper the expected penetration. Tissue composition and molecular absorption are among several other factors that play into the laser end effect. The neodymium:yttrium-aluminum-garnet (Nd:YAG) laser, for example, produces light in the near infrared region (1060 nm) and penetrates to a depth of approximately 5-10 mm in most tissues (at its wavelength, Nd:YAG is not absorbed by hemoglobin or water in any significant quantity). The CO2 laser with a wavelength of 10,600 nm (longer wavelength, thus should penetrate more deeply) penetrates only to a depth of less than 0.1 mm because its wavelength is very highly absorbed by tissue water. Ultimately, laser energy and tissue characteristics interact in a complex manner that determines the degree of absorption, penetration, reflection, and scattering of laser energy. Surgeons currently using lasers seek 4 different effects—thermal, mechanical, photochemical, and tissue-welding effects (which is actually mediated through thermal energy). The most common utilization is the thermal effect, whereby light energy is absorbed and transformed into heat. This results in the denaturation of proteins at 42-65°C, the shrinkage of arteries and veins at 70°C, and cellular dehydration at 100°C. Once water has completely evaporated from tissue, the temperature rapidly rises, carbonization then occurs at 250°C, and, finally, vaporization occurs at 300°C. The mechanical effect results, for example, when a very high power density is directed at a urinary calculus and a column of electrons is freed rapidly at the stone surface. This creates a plasma bubble that swiftly expands and acts like a sonic boom to disrupt the stone along stress lines. The photochemical effect refers to the selective activation of a specific drug or molecule, which may be administered systemically but is taken up in selected tissues. By activation of the molecule or drug by a specific wavelength of light, the molecule is transformed into a toxic compound(s), often involving oxygen-free radicals that can cause cellular death through destruction of DNA crosslinks. This is a novel approach to destroying superficial skin or mucosal malignant and premalignant lesions. Lasers are ideally suited because of their power and specific wavelength. Finally, the tissue-welding effect is derived by focusing light of a particular wavelength to induce collagen cross-linking. By adding proteinaceous materials (eg, 50% human albumin, also known as tissue solder) directly to the tissue edges to be welded or a chromophore that absorbs at the laser's wavelength, increased tensile strength and decreased peripheral destruction can be achieved. This section focuses on the different types of laser energies that have urologic applications and their basic physical properties. The specific urologic applications of each laser type is discussed below in Current Laser Applications. The ruby laser was the first visible laser produced using a synthetic ruby crystal surrounded by a flash tube. The laser produces red light at a wavelength of 694 nm. The crystal's lasing properties degrade with high temperatures; therefore, it is best used at low repetition pulse rates, although a short Q-switched mode is now in favor. The ruby laser is less efficient than more modern lasing materials. The 695-nm emission, however, is highly absorbed by melanin and is currently used in a Q-switched mode to remove pigmented lesions and tattoos, with little scarring. This laser has little use in urology outside of treating cutaneous lesions and removing hair (eg, from perineal skin prior to urethroplasty). The CO2 laser emits in the invisible far infrared portion of the EM spectrum, at 10,600 nm. It usually is coupled with a visible helium-neon beam for guidance. Its beam is highly absorbed by water; therefore, it vaporizes water-dense tissues to a superficial depth of less than 1 mm. Heat conduction results in thermal coagulation down to a depth of about 0.5 mm, with only small vessels less than 0.5 mm coagulated effectively. The beam is delivered using an articulating arm with mirrors and a hand piece, which can focus or defocus the lens. A waveguide tube can also be used for laparoscopic use. Studies in 1961 showed neodymium produced stimulated emissions. The ion (Nd3+) was then used to dope many different crystals. The Y3 Al5 O12 crystal affectionately known as YAG is used commonly today because of its efficiency, optical quality, and high thermal conductivity, which permits high rates of repetition. The Nd:YAG laser emits a beam at 1064 nm (near infrared) and can be delivered in a continuous, pulsed, or Q-switched mode. The 1064-nm wavelength allows for a relatively deep penetration of as much as 10 mm because this frequency is outside the absorption peaks of both hemoglobin and water. It has good hemostatic (coagulates blood vessels as much as 5 mm in diameter) and cutting properties and is suitable for lithotripsy when Q-switched. An optical fiber is used for delivery, which may be passed through all types of endoscopes. A sapphire or crystal tip, which decreases backscatter and allows for precise cutting using a direct touch technique, may also be used at the end of an optical fiber. The frequency-doubled, double-pulse Nd:YAG (FREDDY) laser is a short-pulsed, double-frequency solid-state laser with wavelengths of 532 and 1064 nm. It is a low-power, low-cost laser developed for intracorporeal lithotripsy that has been a subject of recent investigation. Although the FREDDY laser is effective for lithotripsy, it is does not have a soft-tissue application. This laser, also known as a potassium-titanyl phosphate (KTP) laser, yields a green visible light beam of 532 nm by passing an Nd:YAG-produced beam (1064 nm) through a KTP crystal that doubles its frequency (thus, halves its wavelength). This light penetrates less than Nd:YAG because of its shorter wavelength and its absorption by hemoglobin. It is used for incisions, resection, and ablation and can be passed through an optical fiber and thus through endoscopic instruments. One disadvantage of KTP laser energy is that tissue carbonization can be observed, rather than a true ablative effect. The lasing medium is an organic liquid dye that must be excited optically by another laser or flash lamp. The wavelength emitted depends on the type of dye used, which can be changed or adjusted. The emitted light, therefore, can be tuned to cover a wide spectrum of visible light. In the pulsed mode, this laser is used for lithotripsy and ablation of vascular lesions. The most common dye used is coumarin, which produces a wavelength of 504 nm when excited by a flashlamp. As opposed to a solid-state laser, the dye in the lasing chamber requires replacement, which may be inconvenient and expensive compared with the maintenance of newer laser systems. This is another tunable laser composed of a chromium-doped mineral known as alexandrite (BeAl2 04). The wavelength range is from 380-830 nm and is strongest at 700-830 nm. This light is absorbed well by melanin; therefore, it can be used for cutaneous lesions. In a 1-ms pulsed mode delivered with an optical fiber, it is used for lithotripsy of pigmented stones. Combined with indocyanine green dye applied to tissues, this laser can also be used for tissue welding. Laser light is produced using light-emitting diodes (LEDs) between reflecting mirrors in a resonator tube. They are smaller, more efficient, and potentially cheaper than most other lasers now in use. Their wavelength can be tuned by adding various elements (eg, aluminum, indium). An 805-nm laser is produced using AlGaAs, and a 1000-nm beam is produced from the active compound InGaAs. These lasers are currently used for tissue coagulation and thermal treatment of solid organs, including the prostate. In this setting, the laser energy is delivered into tissue with optical fibers and it increases the local temperature. Benign prostate tissue is affected, and, as the denatured protein is reabsorbed over time, bladder outlet obstruction should decrease. Holmium:YAG (Ho:YAG) is a somewhat recent addition. It consists of the rare earth element holmium doped in a YAG crystal that emits a beam of 2150 nm. This laser energy is delivered most commonly in a pulsatile manner, using a thermomechanical mechanism of action. It superheats water, which heavily absorbs light energy at this wavelength. This creates a vaporization bubble at the tip of a low–water density quartz or silica fiber used for delivery. This vapor bubble expands rapidly and destabilizes the molecules it contacts. This is ideal for lithotripsy of all stone types  , as in the image below. The absorption depth in tissue is 1-2 mm, as long as it is used in a water-based medium. This specific light energy provides good hemostasis when used in a pulsed mode of 250 ms duration and at low pulse repetition rate. At higher repetition rates, it may also be used for incisions. This is a central stone defect, which is the product of holmium:yttrium-aluminum-garnet (Ho:YAG) laser lithotripsy. This particular stone was composed of cysteine, which will not fragment with the pulsed dye laser. In addition, Ho:YAG produces sulfur dioxide gas when treating cysteine stones, producing a characteristic odor during treatment. The nitrogen laser incorporates inert nitrogen gas (N2) as the lasing medium, and, when excited by optical energy, it emits light with a wavelength of 337 nm. This laser has been studied as a component of a diagnostic test for transitional cell carcinoma (TCC) and other mucosal malignancies using autofluorescence. For this use, the beam is delivered using a quartz optical fiber and the stimulated fluorescence produces light, which is transmitted back through the same fiber to a detection system. For soft-tissue incisions (eg, urethral strictures, posterior urethral valves, endopyelotomy, bladder neck contractures), use Ho:YAG, Nd:YAG, or KTP. For resection and ablation (eg, benign prostatic hyperplasia [BPH], TCC, condylomata, penile carcinoma, bladder and skin hemangiomata), use Nd:YAG, Ho:YAG, KTP:YAG, semiconductor diode, or CO2. For lithotripsy (renal pelvis, ureter, and bladder stones), use Ho:YAG, FREDDY, pulsed dye, or alexandrite. For tissue welding (eg, vasovasotomy; urethral reconstruction for hypospadias, strictures, diverticula, or fistulas; pyeloplasty, bladder augmentation, and continent urinary diversion), use diode, KTP, Nd:YAG, or CO2. For autofluorescence (eg, for diagnosis of bladder malignancies), use a nitrogen laser. For laser hair removal (eg, perineal skin used for local urethral grafts), use ruby, alexandrite, diode, or Nd:YAG. The thulium:YAG laser has recently been investigated in an attempt to improve on some of the shortcomings of the Ho:YAG laser. This new laser more closely matches the water absorption peak in soft tissue to minimize collateral tissue damage. However, no difference in urinary parameters has been demonstrated in short-term follow-up thus far. It has also been studied as a new endoscopic lithotrite, with promising initial results. Clinical experience with this laser still remains limited and reflects technical issues with the fiber delivery systems. In recent years, advances in laser and fiberoptic technology have made lasers ideally suited to travel through routes in the human body previously unexplored by hand or scalpel. With the widespread use of small-diameter endoscopic instruments in urology, this field has been drastically and positively influenced by laser technology, perhaps more so than any other medical subspecialty. The composition, location, and the size of urinary stones may direct the type of laser and fiber used, the method of approach (eg, retrograde or anterograde), pulsation mode, and power output. The location, size, and depth of tumors and other lesions will dictate the same parameters. Aldoukhi AH, Roberts WW, Hall TL, Ghani KR. Holmium Laser Lithotripsy in the New Stone Age: Dust or Bust?. Front Surg. 2017. 4:57. [Medline]. [Full Text]. Gross AJ, Netsch C, Knipper S, Hölzel J, Bach T. Complications and early postoperative outcome in 1080 patients after thulium vapoenucleation of the prostate: results at a single institution. Eur Urol. 2013 May. 63(5):859-67. [Medline]. Kronenberg P, Traxer O. Update on lasers in urology 2014: current assessment on holmium:yttrium-aluminum-garnet (Ho:YAG) laser lithotripter settings and laser fibers. World J Urol. 2015 Apr. 33 (4):463-9. [Medline]. Ketan PV, Prashant HS. Thulium laser enucleation of the prostate is a safe and a highly effective modality for the treatment of benign prostatic hyperplasia - Our experience of 236 patients. Urol Ann. 2016 Jan-Mar. 8 (1):76-80. [Medline]. [Full Text]. Iacono F, Prezioso D, Di Lauro G, Romeo G, Ruffo A, Illiano E, et al. Efficacy and safety profile of a novel technique, ThuLEP (Thulium laser enucleation of the prostate) for the treatment of benign prostate hypertrophy. Our experience on 148 patients. BMC Surg. 2012. 12 Suppl 1:S21. [Medline]. [Full Text]. Barbalat Y, Velez MC, Sayegh CI, Chung DE. Evidence of the efficacy and safety of the thulium laser in the treatment of men with benign prostatic obstruction. Ther Adv Urol. 2016 Jun. 8 (3):181-91. [Medline]. [Full Text]. Yang Z, Wang X, Liu T. Thulium laser enucleation versus plasmakinetic resection of the prostate: a randomized prospective trial with 18-month follow-up. Urology. 2013 Feb. 81(2):396-400. [Medline]. Lerner LB, Rajender A. Laser prostate enucleation techniques. Can J Urol. 2015 Oct. 22 (5 Suppl 1):53-9. [Medline]. Pearce SM, Pariser JJ, Malik RD, Famakinwa OJ, Chung DE. Outcomes following Thulium vapoenucleation of large prostates. Int Braz J Urol. 2016 Jul-Aug. 42 (4):757-65. [Medline]. [Full Text]. Marguet CG, Sung JC, Springhart WP, L'Esperance JO, Zhou S, Zhong P, et al. In vitro comparison of stone retropulsion and fragmentation of the frequency doubled, double pulse nd:yag laser and the holmium:yag laser. J Urol. 2005 May. 173(5):1797-800. [Medline]. Dubosq F, Pasqui F, Girard F, Beley S, Lesaux N, Gattegno B, et al. Endoscopic lithotripsy and the FREDDY laser: initial experience. J Endourol. 2006 May. 20(5):296-9. [Medline]. Fuh E, Haleblian GE, Norris RD, Albala WD, Simmons N, Zhong P, et al. The effect of frequency doubled double pulse Nd:YAG laser fiber proximity to the target stone on transient cavitation and acoustic emission. J Urol. 2007 Apr. 177(4):1542-5. [Medline]. Misrai V, Kerever S, Phe V, Zorn KC, Peyronnet B, Rouprêt M. Direct Comparison of GreenLight Laser XPS Photoselective Prostate Vaporization and GreenLight Laser En Bloc Enucleation of the Prostate in Enlarged Glands Greater than 80 ml: a Study of 120 Patients. J Urol. 2016 Apr. 195 (4 Pt 1):1027-32. [Medline]. Woo H, Reich O, Bachmann A, et al. Outcome of GreenLight HPS 120-W laser therapy in specific patient populations: those in retention, on anticoagulants, and with large prostates (≥80 mL). Eur Urol Suppl. 2008. 7:378-383. Jaeger CD, Krambeck AE. Holmium laser enucleation of the prostate for persistent lower urinary tract symptoms after prior benign prostatic hyperplasia surgery. Urology. 2013 May. 81(5):1025-9. [Medline]. Mmeje CO, Nunez-Nateras R, Warner JN, Humphreys MR. Age-stratified outcomes of holmium laser enucleation of the prostate. BJU Int. 2013 Mar 19. [Medline]. Grasso M. Experience with the holmium laser as an endoscopic lithotrite. Urology. 1996 Aug. 48(2):199-206. [Medline]. Sciarra A, Von Heland M, Minisola F, Salciccia S, Cattarino S, Gentile V. Thulium Laser Supported Nephron Sparing Surgery for Renal Cell Carcinoma. J Urol. 2013 Jan 29. [Medline]. Thomas AZ, Smyth L, Hennessey D, O'Kelly F, Moran D, Lynch TH. Zero Ischemia Laparoscopic Partial Thulium Laser Nephrectomy. J Endourol. 2013 Mar 8. [Medline]. Perkash I. Ablation of urethral strictures using contact chisel crystal firing neodymium:YAG laser. J Urol. 1997 Mar. 157(3):809-13. [Medline]. Schneede P, Muschter R. [Laser applications in condylomata acuminata]. Urologe A. 1994 Jul. 33(4):299-302. [Medline]. Windahl T, Andersson SO. Combined laser treatment for penile carcinoma: results after long-term followup. J Urol. 2003 Jun. 169(6):2118-21. [Medline]. Koenig F, McGovern FJ, Althausen AF, Deutsch TF, Schomacker KT. Laser induced autofluorescence diagnosis of bladder cancer. J Urol. 1996 Nov. 156(5):1597-601. [Medline]. Absten GT. Physics of light and lasers. Obstet Gynecol Clin North Am. 1991 Sep. 18(3):407-27. [Medline]. Aho TF, Gilling PJ, Kennett KM, Westenberg AM, Fraundorfer MR, Frampton CM. Holmium laser bladder neck incision versus holmium enucleation of the prostate as outpatient procedures for prostates less than 40 grams: a randomized trial. J Urol. 2005 Jul. 174(1):210-4. [Medline]. Bradley D. Plastic Lasers Shine Brightly. Nature. 1996. 382:671. Chacko KN, Donovan JL, Abrams P, Peters TJ, Brookes ST, Thorpe AC, et al. Transurethral prostatic resection or laser therapy for men with acute urinary retention: the ClasP randomized trial. J Urol. 2001 Jul. 166(1):166-70; discussion 170-1. [Medline]. Elzayat EA, Al-Mandil MS, Khalaf I, Elhilali MM. Holmium laser ablation of the prostate versus photoselective vaporization of prostate 60 cc or less: short-term results of a prospective randomized trial. J Urol. 2009 Jul. 182(1):133-8. [Medline]. Fried NM. Potential applications of the erbium:YAG laser in endourology. J Endourol. 2001 Nov. 15(9):889-94. [Medline]. Fried NM, Murray KE. High-power thulium fiber laser ablation of urinary tissues at 1.94 microm. J Endourol. 2005 Jan-Feb. 19(1):25-31. [Medline]. Gravas S, Bachmann A, Reich O, Roehrborn CG, Gilling PJ, De La Rosette J. Critical review of lasers in benign prostatic hyperplasia (BPH). BJU Int. 2011 Apr. 107(7):1030-43. [Medline]. Matin SF, Yost A, Streem SB. Ureteroscopic laser endopyelotomy: a single-center experience. J Endourol. 2003 Aug. 17(6):401-4. [Medline]. Montorsi F, Naspro R, Salonia A, et al. Holmium laser enucleation versus transurethral resection of the prostate: results from a 2-center, prospective, randomized trial in patients with obstructive benign prostatic hyperplasia. J Urol. 2004 Nov. 172(5 Pt 1):1926-9. [Medline]. Reich O, Bachmann A, Schneede P, Zaak D, Sulser T, Hofstetter A. Experimental comparison of high power (80 W) potassium titanyl phosphate laser vaporization and transurethral resection of the prostate. J Urol. 2004 Jun. 171(6 Pt 1):2502-4. [Medline]. Reich O, Bachmann A, Siebels M, Hofstetter A, Stief CG, Sulser T. High power (80 W) potassium-titanyl-phosphate laser vaporization of the prostate in 66 high risk patients. J Urol. 2005 Jan. 173(1):158-60. [Medline]. Syed HA, Biyani CS, Bryan N, Brough SJ, Powell CS. Holmium:YAG laser treatment of recurrent superficial bladder carcinoma: initial clinical experience. J Endourol. 2001 Aug. 15(6):625-7. [Medline]. Tan A, Liao C, Mo Z, Cao Y. Meta-analysis of holmium laser enucleation versus transurethral resection of the prostate for symptomatic prostatic obstruction. Br J Surg. 2007 Oct. 94(10):1201-8. [Medline]. Teichman JM, Chan KF, Cecconi PP, Corbin NS, Kamerer AD, Glickman RD, et al. Erbium: YAG versus holmium:YAG lithotripsy. J Urol. 2001 Mar. 165(3):876-9. [Medline]. Tooher R, Sutherland P, Costello A, Gilling P, Rees G, Maddern G. A systematic review of holmium laser prostatectomy for benign prostatic hyperplasia. J Urol. 2004 May. 171(5):1773-81. [Medline]. Watterson JD, Sofer M, Wollin TA, Nott L, Denstedt JD. Holmium: YAG laser endoureterotomy for ureterointestinal strictures. J Urol. 2002 Apr. 167(4):1692-5. [Medline]. Disclosure: Received consulting fee from Karl Storz Endoscopy for consulting.